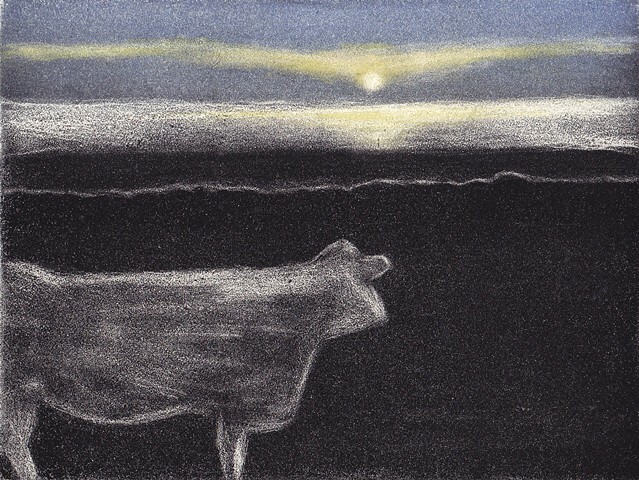 A Cornish cow, watching the sun drop into the Atlantic Ocean, inspired this print. My husband and I had joined this bovine sky gazer on Calartha Farm in southwest Cornwall after a late afternoon's walk along the Southwest Coast Past. Andrew Baldwin, a Walsh printmaker, developed the technique, dubbed the "Poor Man's Aquatint," used to make this print. I learned the technique in a workshop that Baldwin taught at Zea Mays Printmaking Studio in Florence, MA. Edition of 12 prints; other prints available in black and white.